A small, easy-to-use calendar reminder program! an Astronomical Calendar with daily notes, sticky notes application scheduling, sun and moon information, multiuser support. 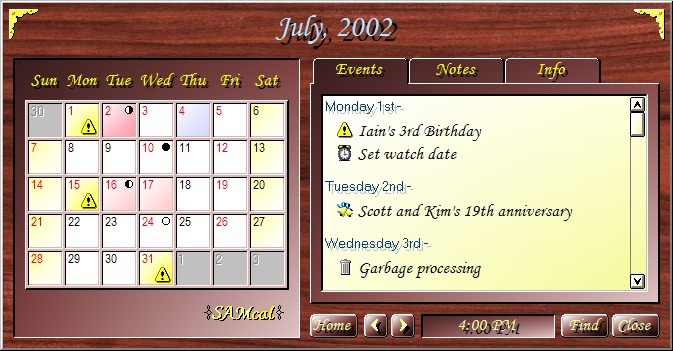 Calendar Reminder Rrogram - SAMcal is a small, easy-to-use calendar/reminder program. It has a highly configurable interface and is quite flexible in defining when an event occurs. Features include: daily notes, sticky notes application scheduling, sun and moon information, multiuser support, and much more. Multiple event lists! You may now define more than one event list - only the events belonging to the selected list show up on the calendar at any given moment. E-mail event notifications. You can set it up to send e-mail for all events or selected events. An Astronomical Calendar. This window shows you (graphically) when the sun and moon are up, and the portions of the night that are considered "twilight" (astronomical, nautical, or civil). Daily notes are now edited in place, with many more formatting options. 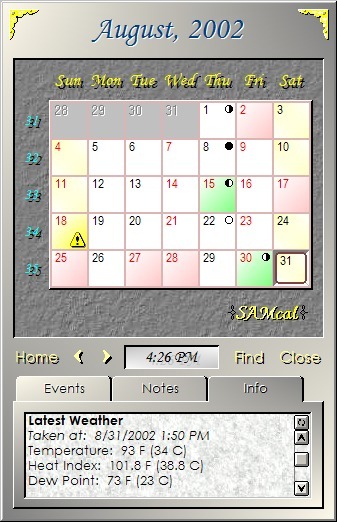 There is now a "missed alarms" dialog, to tell you what alarms were set to go off since the last time SAMcal was running, but couldn't because it wasn't. Sticky notes! These may be managed from the SAMcal main window or from the SAMcal tray icon(s). New event type! The "fixed day interval" event type has been expanded to be the new "periodic" event, which can be a fixed day interval, a fixed month interval, or a fixed year interval. New Weather Plugin! There is now a plugin that provides (via a network connection) the latest observed weather for many sites worldwide, and forecast weather for many US sites. Quick alarms! Make it easier to set up an alarm. Group alarms! Display a list of events belonging to a given group that occur today. Event suppress or reschedule! Individual occurrences of repeating events may be suppressed or rescheduled. New bugs! Well, there's no sense living in denial, is there?